Silo Ventilation Systems offer energy efficient silo vent units that come with a wind driven ventilator. As the silo vent units are powered by the wind, they are environmentally friendly and completely cost free all day, everyday. There are two different silo vent units, one which is for use in all types of non sealed silos and the other, the Damper model is designed for use in sealed silos. The Damper seals the silo at the ventilators throat and remains closed for the chemical treatment period. Once this period has finished the Damper will be opened from the ground via a cable. 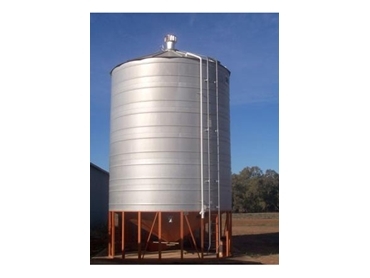 The Damper silo vent unit enables the grain to breath as it will exhaust any build up of heat, humidity and condensation which are inside the sealed silo. Located in the cone of the sealed silos are air intake vents which the Damper will work well in conjunction with. These air intake vents will make sure that air is drawn in from the cone of the silo once the chemical treatment period has taken place. This air will then be passively moved through the silo and exhausted out of the top reducing the hot spots in the silo and keeping the stored commodity much cooler.